Intro: Enter a world where you can bend the laws of time. 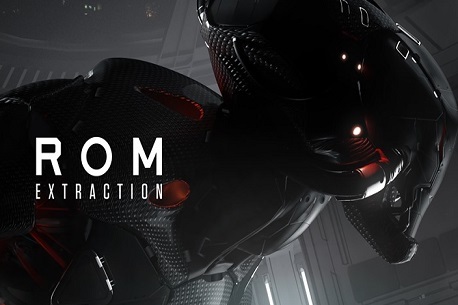 In ROM: Extraction, you play as a member of an Orb Extraction Unit in the year 2076, on your way to extract alien eggs from chambers on the moon. Your dropship is being prepared for launch, giving you just a few minutes to defend yourself against an onslaught of attacking extraterrestrial-bots who are protecting these chambers. Your suit is fitted with an Orb dispenser which you use to spawn Orbs in your hand, and then throw at the extraterrestrial-bots. You are also holding a direct energy pistol which is VERY useful when igniting Orbs for strategic kills. In addition, the pistol contains advanced technology called “Reflex,” which allows you to slow time. Throw, Slow & Shoot to take down enemies in the most strategic way! Review: You play as a robot who is a member of the Orb Extraction Unit. While going about your day job, basically hoards of attacking extraterrestrial-bots want their alien eggs back (that you were collecting) so you are going to have to take care of them with the help of a few different energy orbs and a gun. …oh! And the ability to slow down time. Being able to enter bullet time is something that will often be the most exciting moments in the game as you try and take out as many enemy robots as you can before it runs out. The gameplay works with both your hands working together. On hand controls the gun and the other the energy orbs which can be changed to sticky, multishot and splitter (to name just a few) by picking up various powerups. This is a game that requires fast thinking, quick shooting and even quicker reactions. But the good news is it looks amazing and while there is only one level to play it when the action heats up and you pull the trigger to slow down time, it looks simply jaw dropping. There really isn’t that much to say about the gameplay, just look, aim, shoot, or throw! OK, so it’s not that easy, but you get the point. Verdict: I feel price has been the biggest issue with the game. Its starting price was £15 ($20) and now it’s just £4 ($5). That is just a quarter of the original asking price! Considering this game just has one main playing area and no online multiplayer, the original asking price was far too much. But as this new low price you suddenly have a high quality shoot ’em up that offers real value for money. Everything looks amazing and while I feel the action does get a little too hectic, too early in the game it still feels amazing to play. The balls and gun system works well with the time slowdown function and at times it felt incredible to play. Take my advice, even if it doesn’t look like your cup of tea, give it a download now while it offer got value for money.